Oh my sweet friends. How you have humbled me. Thank you so much for your prayers and healing thoughts today. The eye surgeon said my surgery today went well. I will not know for a few days what the outcome will be. I only had surgery on my right eye. I will be having two or possibly three more surgeries. They are scheduled for the next three Fridays. Today was scary and so very painful. You are fully alert and can feel the laser hit the back of your eye. I did not ask for medication. The last time I had laser surgery there was no pain at all. I did not expect this pain today. I have a very high pain threshold. I don't know what patients do who can't tolerate pain. The surgery is very brief though. Just when I thought I could not possibly take any more it was over. I have had a dull ache in my eye all day but it is nothing that tylenol can't take care of. The hardest part will be going back there next Friday to do it all over again on my left eye. We were also informed this morning that we would have to pay a co-pay of $1500-2000. ($500 per surgery) There goes our summer vacation. Please, if you know someone with diabetes, tell them that the threat to their eyes is real. Tell them that thinking that they can't afford their medication is not worth the risk. Please find a way to get your medication. Please listen to me. My retinopathy started ten years ago. My ex-husband cut me off of his health insurance. For three years, I supported my children alone and did not pay for my diabetes medications. Three years that took a terrible toll on my eyes. God blessed me the day I met my husband, Bill. Bill not only took on the responsibilities of a wife with diabetes, he also became a mentor and friend to my three children. We are so blessed to have him in our lives. I also feel blessed to have made so many wonderful friends here. I felt your presence today. I was lifted up by your prayers. Thank you from the bottom of my heart. I've tried to make my blog a fun place to visit. I try to keep the whining to a minimum. My life, like everyone else's life is not perfect. But, for the most part I have a good life. Today I went to an eye surgeon. Last week, my eye doctor told me that I had a vein in my eye that did not look good. Today, an eye surgeon, in a matter of fact tone of voice, told me that I am going blind. The veins by my optic nerves in both eyes are bleeding. Tomorrow I am having emergency laser surgery on my eyes. They will be using two lasers. One hot and one cold. The hot laser will probably destroy my side vision. The cold laser will hopefully stop the bleeding and save my central vision. I walked around my house this afternoon, touching things, looking at my children's faces, the flowers in my garden. I am such a visual person. My earliest memories are visual. The bright green leaves on a tree. The open bins of Christmas ornaments in Germany at Christmas time. My daddy's blue, blue eyes. I don't know what I will do if I lose my vision. My husband who is a devout Christian was with me today. He can say a prayer that will touch your heart whether you believe or not. He had to go to work tonight but before he left he put his hands over my eyes and held me as he spoke to God asking for healing for me. And I, who struggle with my faith, whispered Amen and begged God to hear him. Picture above: Left to right, pretty earrings from Pam at Blog Cabin Fever, my garden, vintage pillowcase, sneak peak at my Vintage Boudoir swap for Julie, my slightly wind damaged hydrangea, my tomatoes,sweet, sweet pincushion made by my friend Miss Paula at Gathering of Friends, vintage hymnals, Angels in my garden. For the first time in I don't remember how many years, it was rainy, cold and cloudy this Memorial Day weekend. We made the best of it and it ended up being a nice weekend together. My hubby and I started the weekend with a free blue grass concert in a local park. The next day we woke to rain and figured our yearly trip to the mile long yard sale in Fresno was canceled. But, my best friend called from the sale and she was finding all kinds of bargains. We went to breakfast and by the time we got there the rain had paused and we walked from one end to the other. We found a nice plant stand for the patio and the pretty tablecloth below. Sunday it was still drizzling but we drove up to the mountains anyway for a Peddler's Fair in Coarsegold. It was muddy, sprinkling and cold! I tucked myself under my hubby's arm and went hunting for treasures. A lot of the dealers were packing up and calling it a weekend. I managed to find one bluebird pillowcase and an expandable mug rack. I plan on painting it my favorite blue and hanging it in my laundry room with some of my vintage aprons. Yesterday, we took my mom to the cemetery. My dad was a veteran. The cemetery put flags on all of the veteran's graves. There seemed to be flags everywhere. The bell tower was playing old hymns and we saw many families gathered at grave sites quietly talking. It was such a peaceful place to be and pay our respects to the veterans who have passed on. I feel so blessed to have a hubby who doesn't necessarily share my treasure hunting gene, but supports it completely by taking me on my hunts. I did go see the new Indiana Jones movie with him. We enjoyed it but liked the older ones better. We ended up our weekend by making ribs and then having our own Indiana Jones moviefest at home. Great weekend! Rachael at the Rose Room is having a Getting to Know You party to celebrate her 100th post. I love visiting Rachael's Rose Room and couldn't help but be part of her party! She's asked us to show where we blog. I almost didn't show this picture because, I hate my desk. I share it with the men in the family. One day, I want a chippy white foo-foo desk, just for me. For now, I make the guys stare at my dolls while they're borrowing my computer. My oldest has a Mac book which I am coveting so he doesn't sit here much anymore. Collections: what don't I collect?! How Did You Get Into Blogging: I think I found blogs through someone's ME page on Ebay. The rest is history. Please, go visit Rachael and tell her congratulations. My Show and Tell Sunday post is down below. I would have added more pictures to that but I am about ready to shoot my computer or the dweebs at Typepad who decided to change the compose page. 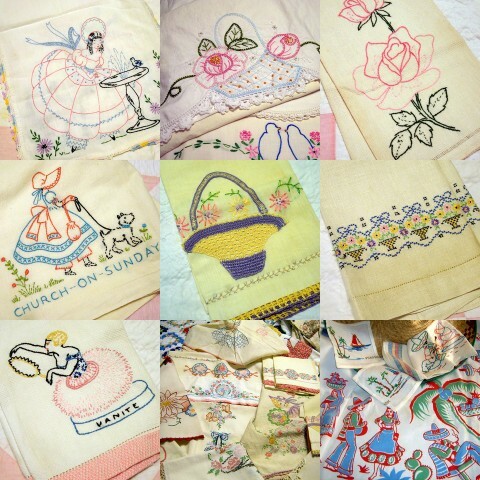 You can see more of my china collections on my Flickr. It is taking me twice as long to post and I can't get anything to look the way I want it. I hope they fix it soon!! Come in. Sit down. I've made us some tea. Have a piece of cake. It's calorie free. Today's Show and Tell is China, Silver and Crystal. Here's just a tiny sample of my china. 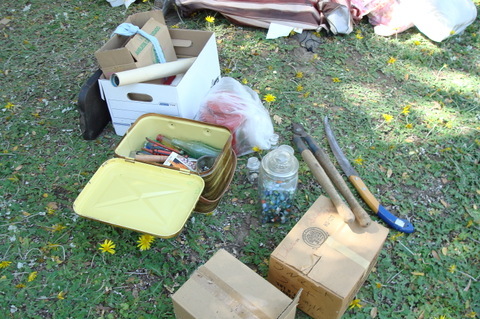 These are pieces bought at estate sales and thrift stores. 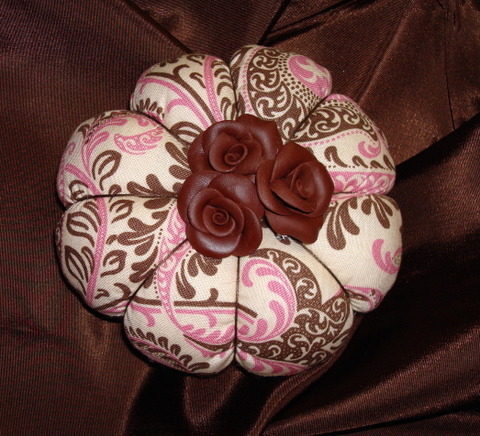 The pretty napkin rings were a gift from my friend Beth Leintz. I found the tablecloth yesterday at a yard sale and paid a whopping $15. for it. Let's have some tea and gossip about all of the other Show and Tell participants today. Analise is hosting and she has a sweet story about her pretty china. Last year when everyone was making granny square blankets, I decided to brush off my dusty crochet hooks and try to make a blanket. My daughter showed me how to make a basic granny square and I proceeded to make square after plain square. I like projects that are finished quickly and I think I made it to 36 squares. Then I let a day go by before I did one and then a week go by. Pretty soon they were sitting in a bag collecting dust. My daughter however loves to crochet and makes the most beautiful blankets and stuffies. Someone suggested a collaboration and she took my bag of squares home and turned them into this beautiful blanket for my mom. Oh! How am I going to let my mom put this in her room? I'll have to go in and visit it every day! It's so pretty!! Note to self: At the next estate sale, it might be wise to leave the vintage cookbooks for someone else while dieting. Today's Show and Tell Sunday is all about Linens. 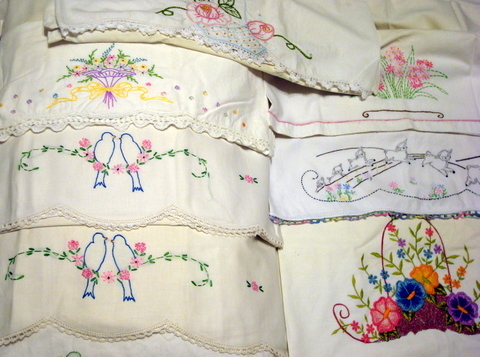 I love embroidered linens. These are just some of my favorites. 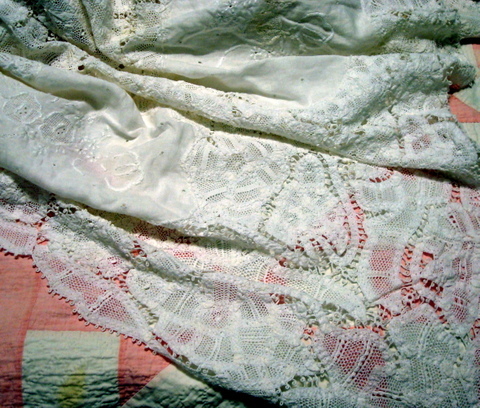 I like to use vintage linens in my sewing. 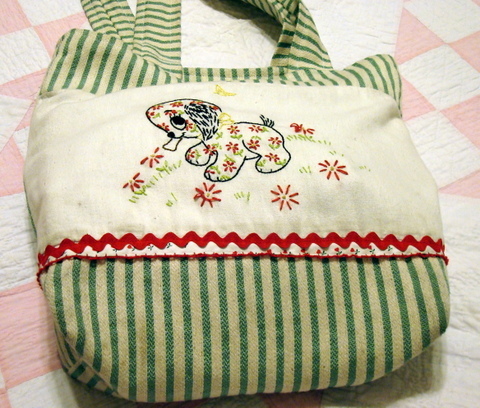 This is my favorite antique and thrift shopping bag. 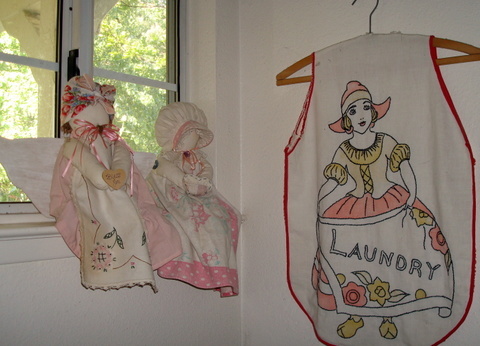 Here's a corner of my laundry room. 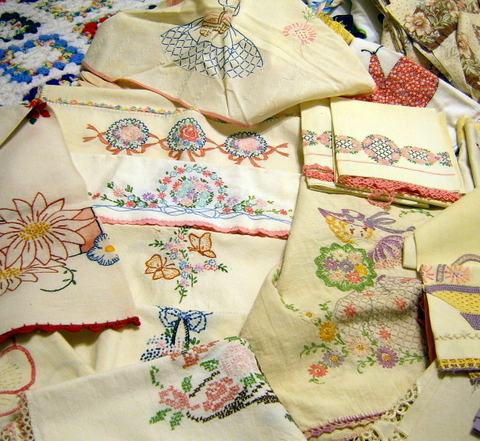 The rag dolls are made from vintage linens. I made the doll on the left. Don't even get me started on tablecloths. We'd be here all day! Thanks so much Cerri. I've got to get me some coffee so I can sit here and check out everyone else's linens. Want to see what I've been up to this week when I wasn't at doctor's offices? 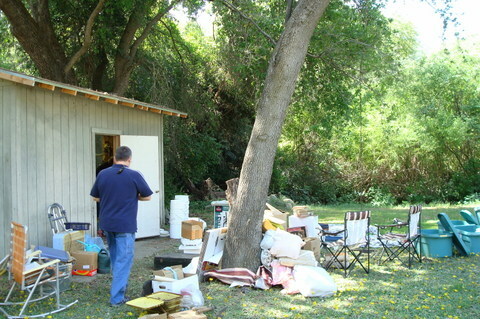 We took a drive to Kaweah, California to clean out my in-law's "little shed". My father-in-law passed away over three years ago and we finally got around to cleaning out his tool shed. The property was sold more than two years ago and the new owner was nice enough to not push us to get it packed up. 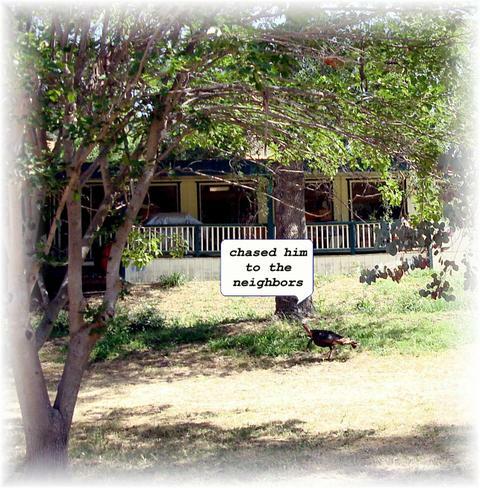 While the guys sorted, I chased a turkey around the property. He wouldn't cooperate for a good picture though. 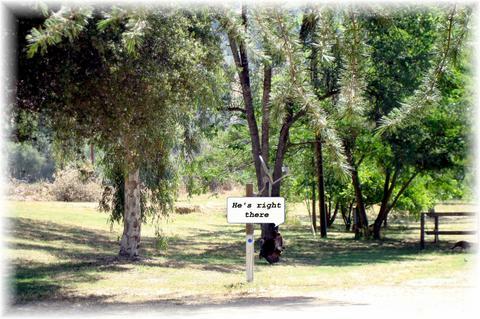 We're going to miss this beautiful place (turkeys and all). Here's my little pile of stuff. My hubby's marbles that I thought he'd lost, old bottles and tools. 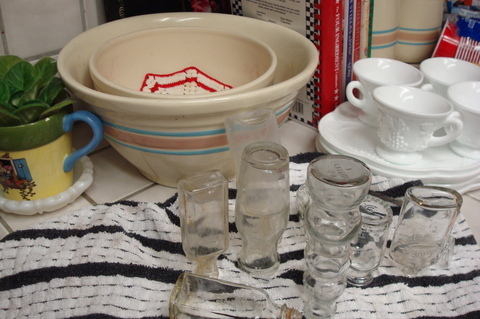 A milk glass snack set. 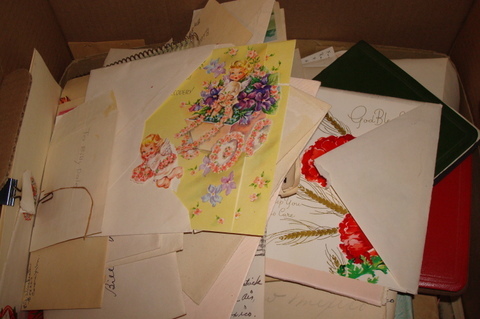 This box was full of old greeting cards. My mother-in-law was going to take off the stamps and throw the rest away. No! So, I offered to take off the stamps and send them to her. I've been having fun reading through the cards. 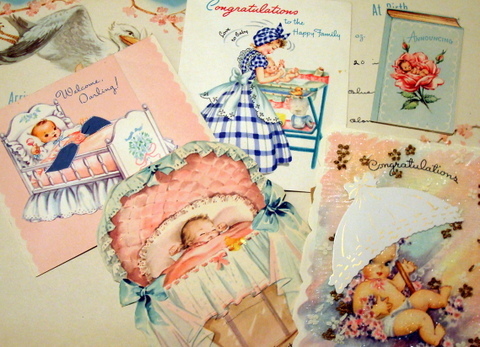 Most were sent to my in-laws when my hubby was born. I kept teasing him that he must have been a girl because they were all pink babies. Then I finally found one that said, congratulations on your baby boy! Good thing...I was getting worried. Today, I got around to washing some of the bottles and the snack set. I'm going to put buttons in some of the bottles. I'm not sure if I'll keep the snack set yet. My hubby and I have a deal. When I bring something into the house, I give away or sell something. Aren't these the cutest, babushkas ever? My daughter crocheted them for me for Mother's Day. Then my kids and my son-in-law chipped in and bought me a new swing for the back yard. When we actually have some time, we'll get it put together. I've been busy getting poked, prodded and scanned. Today, I have to go back for another mammogram to check out "something suspicious" on the last one. Say a little prayer for me please. If you're one of my "real life" friends, I'm sorry I haven't called. Been just too busy with life. 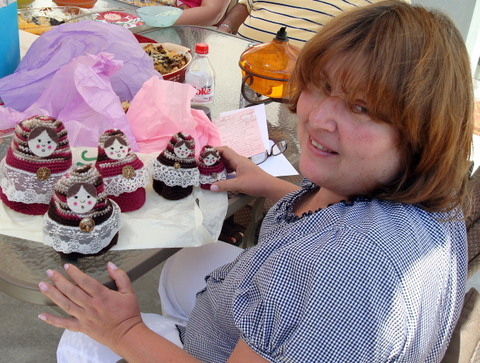 That's me with my new dolls. I'm kinda shaped like my babushkas. I have a big life decision coming up about that extra weight around my tummy. I'll be back in a few days with some news or some sewing, whichever comes first.